Facing the sea, St. Angelo Fort is one of the most attractive centers in Kannur district in Kerala. Located 3 km from Kannur on the coast of the Arabian sea, it is locally known as Kannur Kota and Kannur Fort Fort. It was built in 1505 by Dom Francisco de Almeida, the first Portuguese Viceroy of India with the consent of the ruling Kolathiri Raja. The Dutch captured the fort from Portuguese in 1663 they sold the fort to the king Ali Raja of Arakkal kingdom. In 1790 the British seized the control over it and the fort became one of the important military centres of the British in Malabar. 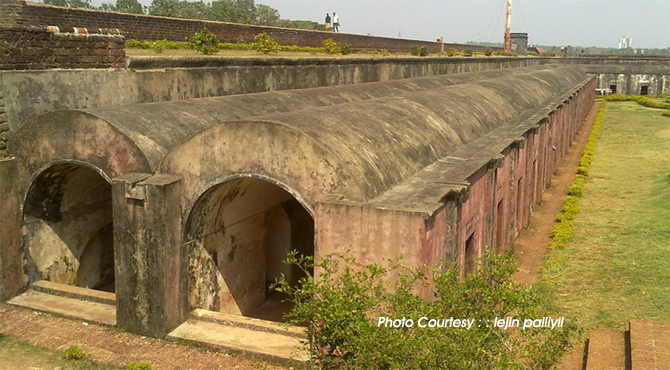 The fort continued to be a symbol of military power and falls within the Kannur cantonment. The Kannur Cantonment is one of the 62 cantonments in the country. The Rijksmuseum in Amsterdam houses a painting of St. Angelo Fort and the fishing ferry behind the fort. Built along the shores of Arabian sea, it is separated by a strong sea wall from the sea. The fort is a massive triangular structure of laterite with strong bastions and a moat. Eventhough some parts have collapsed and fallen into the sea it's ramparts are still in a fairly good state of preservation. A protected monument under the Archeological Survey of India, the fort gives an excellent view the Mappila bay, a natural fishing harbour and the Dharmadam Island sprawling in an area of 5 acres located in the Arabian sea at a distance of 100 meters from the shore. Behind the fort, there is a pathway stretching a kilometer or two into the sea. It is said that there is a secret underground tunnel 21 km long inside the fort which connects Kannur Fort to the Thalassery Fort which is 21 km from the St.Angelo Fort. This tunnel was used by the soldiers to escape from the attack of enemies. A few obsolete guns are seen at the place. Dungeons, once used as a jail, and the magazine still stand. The remains of an early oil lamp lighthouse has been erected inside the Fort and it is the first lighthouse in Kannur. The remains of the British military Cantonment are located nearby. Tourists are permitted to enter the fort every day between 8 am to 6 pm.